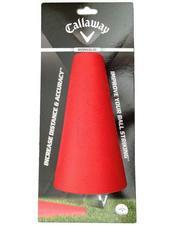 The IronSolid™ swing aid will help you become a better iron player. It is designed to emphasize the proper swing path and reinforce a steeper angle of attack, which is critical for good iron play. This leads to improved ball striking. If you have any more questions about the Callaway Golf Iron Solid (Reinforce correct Swing Path & Steeper Angle); do not see the model you are looking for; need custom options; or prefer to not purchase online, then please call us at (630) 656-1291.